In the past, I used to turn off the telly whenever Gordon Ramsay is on. Now, I am one of his biggest fan. I watch and re watch all his shows over and over again. 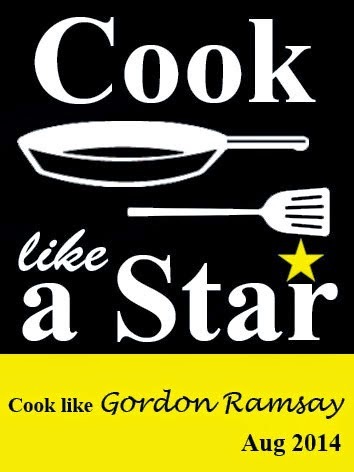 It started with the Gordon Ramsay's Ultimate cookery course that got me hooked on the man. In this show, he presented 100 recipes that, according to him, you can stake your life on. I'm not sure about the staking part but the show really is filled with cooking tips and techniques, making cooking seems easy. The star of this dish is the sweet peppers and onions. It is delicious with the chops. Sweet and sour in taste, it makes a good side to cook for a barbecue party. It goes well with any grilled food. Having cooked some of his recipes from the show, I am now an ardent fan of Gordon Ramsay! These are some of the dishes here, here from the Ultimate Cookery Course. First prepare the peppers. Heat a little olive oil in a large frying pan, then add the onion and peppers. Using a sharp knife, make cuts into the fat of the chops, about 5mm deep and at 3-4cm intervals, making sure you don't cut into the meat. (this will stop the meat from curling up during cooking and will make it cook more evenly.) Season the chops really well on both sides, pushing the seasoning into the meat. Place the cleaned-out frying pan over a high heat until hot and add a dash of oil. Add the chops, garlic and thyme and fry for 203 minutes until coloured. Turn and fry for a further 203 minutes on the other side, pushing the thyme under the chops and breaking up the garlic a little. Towards the end of cooking time, add 3 knobs of butter and baste the chops with it as they are cooking, to speed up the cooking process and keep the chops moist. (Push the fatty edge of the chops towards the back of the pan to help render the fat.) Squeeze the garlic out of its skin and place with the herbs on top of the chops. Transfer the chops to a plate, and rest for 5-10 minutes, spooning over the basting butter now and again. You switched off the telly when GR was on??? I wonder what did he do to make you hate and then like him subsequently??? I know that his language can be too offensive for some but his approach for cooking is always spot on. Nice pork chops! Great flavours! Haha... I didn't realise it is his passion in cooking that made Gordon Ramsay rants and raves so often in the kitchen. I would if I were him if I were to teach some sloppy chefs to cook. Like I said in my post, I only got caught up in him when I started watching his Ultimate Cookery course. Hi Lian, I really like watching Gordon Ramsay shows too, he shares really great cooking tips with the viewers and sometimes I go ah... tht's so simple but I didn't know that. Thx for joining us in CLAS, the sweet peppers and onions sure look good. Agree, some food are so incredibly simple. But with the right technique, it can bring the dish to another level. Wow, such a delicious dish! And you have plated it so beautifully! I like Gordon Ramsay's recipes too! Thanks Joyce. He is a talented chef. This is so well done and nicely arranged! Thanks Amy. Must cook this if you like sweet peppers. Your pork chops looks so good with the sweet and sour capsicums. Thanks Mich for your kind comment.